This stylish apartment is in a character-filled, heritage building and is large, bright and airy with a sense of space thanks to it's high ceiling and wall of windows. It has recently been redecorated, including new carpets, blinds and double-glazed windows. There is elevator access and the added security of 24 hour surveillance cameras in the building. It comes complete with a modern, fully equipped kitchen, including a coffee machine and dishwasher. There is also a washing machine and dryer and WIFI is included. Sleep peacefully in the ultra comfortable queen bed and enjoy the view of the Beehive over your morning coffee as the sun pours in. This is the ideal location from which to explore Wellington's attractions and it's world famous cafe and restaurant scene. 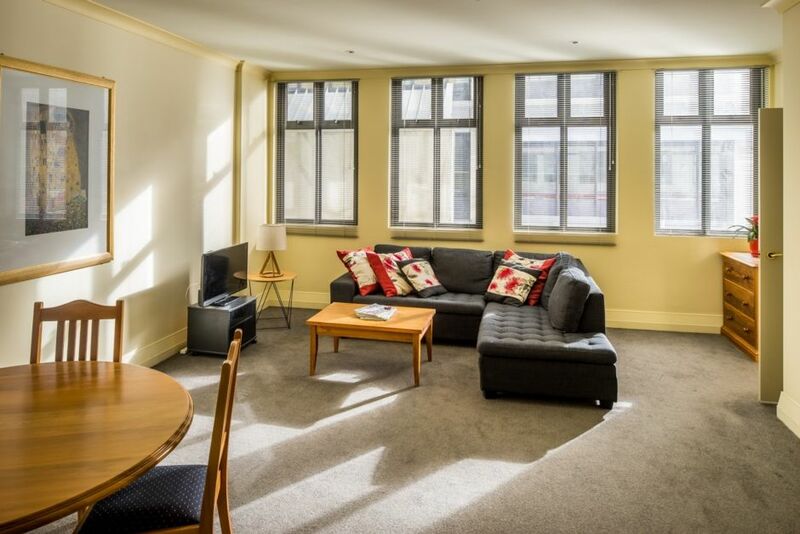 The shopping precinct of Lambton Quay is a 2 minute walk away and the stadium is an easy 15 minute walk...perfect for attending a sporting event or concert. 10 minutes walk takes you to the heart of Wellington's fabulous waterfront, home to Te Papa, the TSB Arena and numerous restaurants and bars. Head across the road for a guided tour of Parliament or wander down to the Cable Car and take a ride to the Botanical Gardens, the Cable Car Museum and the Carter Observatory. If you are planning to go further afield, the main bus and rail hubs are just a few minutes walk from the apartment. A security deposit of $200 is charged at time of booking and will be refunded once the property has been inspected after your departure. A portable baby cot is available for an extra $20 per night. If you require this please let me know in your enquiry. - Maximum of 2 guests allowed in existing bedding. - A cot is available upon request. - A security deposit of $200 applies to this apartment and will be refunded as soon as possible after check-out, once a property manager has confirmed the apartment has been left in a tidy state. Great location and lovely convient apartment, with everything we needed. The windows are brand new and double glazed so they just need a firm push to open them. I will make sure to check the new blinds to ensure they are working properly! Thanks Tom for sending me a message to let me know that you "had a lovely stay thanks - no issues at all'. Absolute fantastic CBD location probably 50 paces from the beehive grounds. Glad you enjoyed your stay and that the apartment was quiet for the little one! This apartment is fantastic! A little inner-city sanctuary - very convenient. This apartment is fantastic! A little inner-city sanctuary - very convenient. Really comfortable with everything you might need. A well equipped kitchen with some extra little touches that make a difference. It felt a real treat to stay there and we will definitely return! Thank you Grace! It was lovely to meet you Deb, you are welcome back any time.